172 pages | 30 B/W Illus. At the turn of the 21st century, a significant boom in the construction of cultural buildings took saw the creation of hundreds of performing arts centers, theaters, and museums. After these buildings were completed, however, many of these cultural organizations struggled to survive, or, alternatively, drifted off mission as the construction project forced monetary or other considerations to be prioritized. 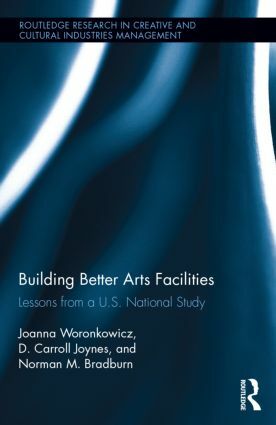 Building Better Arts Facilities: Lessons from a U.S. National Study examines the ways in which organizations planned and managed building projects during this boom, and investigates organizational operations after projects were completed. By integrating quantitative data with case-study evidence, the authors identify the differences between the ways some organizations were able to successfully meet the challenges of a large construction project and others that were not. With empirical evidence and analysis, this book highlights better practices for managing and leading cultural building ventures. Readers of this book – be they arts managers, politicians, board members, city planners, foundation executives, or philanthropists – will find that book provides valuable perspective and insight about building cultural facilities, and that reading it will serve to make building projects go more smoothly in the future. An original empirical investigation of the problems of cultural infrastructural projects that asks uncomfortable questions, and provides effective answers to them, for students, academics and practitioners alike. Joanna Woronkowicz is an assistant professor of nonprofit management and arts administration in the School of Public and Environmental Affairs at Indiana University, Bloomington, USA. She previously served as the Senior Research Officer at the National Endowment for the Arts. D. Carroll Joynes is a Lecturer at the Harris School of Public Policy Studies, University of Chicago, USA. He co-founded the Cultural Policy Center and served as executive director for its first ten years. With Norman Bradburn, he is currently serving as director of the research project Cultural Infrastructure in the United States. Norman Bradburn is the Tiffany and Margaret Blake Distinguished Service Professor Emeritus in the faculties of the University of Chicago’s Irving B. Harris Graduate School of Public Policy Studies, Department of Psychology, Booth School of Business and the College, USA, and a Senior Fellow at NORC, also at the University of Chicago. He is co-director of the American Academy of Arts and Sciences’ Humanities Indicators project and principal investigator of the CPC’s Cultural Infrastructure project. cultural and creative industries in public management and not-for-profit areas.